The National Institutes of Natural Sciences National Institute for Fusion Science, in collaborative research with Nagoya University, has clarified through theory and simulation research that turbulence in a plasma confined in the magnetic field is suppressed and the heat and particle losses are reduced in cases with larger ion mass. This research provides a novel understanding for clarifying the “ion mass effect” which has been a riddle since the beginning of fusion and plasma research. Seeking to further improve plasma performance, from March 7, 2017, plasma experiments utilizing deuterium ions, which have twice the mass of hydrogen, were initiated in the Large Helical Device (LHD) at the National Institute for Fusion Science (NIFS). In numerous plasma experiments being conducted in countries around the world, the use of deuterium is improving the confinement of heat and particles. That is, the phenomenon called “ion mass effect,” in which plasma performance is improved, is observed. However, we do not yet understand the detailed physical mechanism of how the increase in ion mass is linked to performance improvement. This has been one of the most important unsolved problems in plasma physics and fusion research from its beginning. In the plasmas confined in the magnetic field there are various types of waves. In particular conditions those waves grow as time passes, and the so-called “instability” occurs and the plasma becomes turbulent. 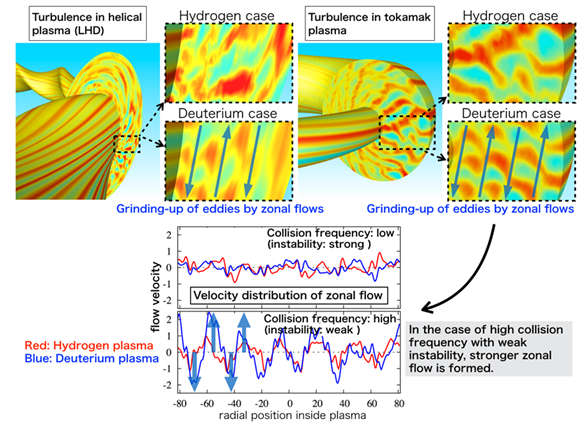 According to research to date, there has been found to occur a unique flow structure called “zonal flow” that is formed spontaneously in a turbulent plasma. Zonal flows take the stripe structure that flows in the opposite direction to each other, and these flows are known to perform an important role in the suppression of the turbulence. However, there remain many unclarified aspects regarding the conditions by which turbulence and zonal flows are formed. If influences brought about by differences in ion mass can be clarified theoretically, we can accurately predict confinement improvements that are observed in experiments. And because we can link confinement improvement to further enhancement of plasma performance, new developments in research are anticipated. The research group of Professor Motoki Nakata, through collaborative research with Professor Tomohiko Watanabe of Nagoya University, conducted five-dimensional plasma turbulence simulations utilizing the “Plasma Simulator” at NIFS and the cutting-edge supercomputer “K” at the RIKEN Advanced Institute for Computational Science in order to analyze instabilities (trapped electron modes) caused by electrons that move back and forth along the magnetic field lines and to analyze in detail the turbulence generated from the instability. As a result, we clarified that the influence of the ion mass appeared remarkably in a high-density plasma and that the detailed physical mechanism in which turbulence is suppressed through an effect caused by electron-ion collisions. Further, we discovered that those phenomena exist in both helical and tokamak plasmas. Thus, we were able to clarify the “ion mass effect” broadly observed and one of the important mechanisms to improve plasma performance. The detailed mechanism that suppresses turbulence is explained below. Turbulence caused due to trapped electron instability weakens the confinement of plasma heat and particles. The collisions among trapped electrons and ions suppress instabilities (suppressing the growth of waves). At a fixed temperature, collisions occur frequently at higher plasma densities. Here, the impacts of collisions in deuterium plasma are remarkable in comparison to hydrogen. As a result, turbulence can be suppressed (Figure 1). Further, we clarified that in the condition in which the instability has weakened, the “zonal flow” becomes stronger and further suppresses the turbulence by grinding large eddies and waves, and eventually improves the confinement of heat and particles (Figure 2). As has been clarified above, a complete image of turbulence suppression in a plasma with large ion mass may be expressed schematically as in Figure 3. These research results provide fundamental knowledge regarding the complete clarification of the “ion mass effect” which was an unsolved issue for many years in plasma physics and fusion research. Further, the results are anticipated to be beneficial in improving plasma not only in helical devices such as LHD, but also in tokamaks as represented by the International Thermonuclear Experimental Reactor (ITER), which is currently under construction. Figure 1: Simulation results which indicate that the increase in collision frequency brings about the decrease in the trapped electron instability. In a helical LHD plasma (left) as well as in a tokamak plasma (right), as collision frequency increases in a higher density plasma, the strength of instabilities in hydrogen plasma (red) and in deuterium plasma (blue) reverses. Instabilities weaken (that is, are stabilized) in plasmas with larger ion mass, and turbulence is suppressed. Dots and dashed lines indicate, respectively, the quantity of heat loss and the collisionality regime which is relevant to the fusion reactors. Comparison of turbulence in helical LHD plasma (left) and in tokamak plasma (right). In the red color area, strong eddies and waves are generated. In a deuterium plasma with large ion mass, the zonal flows are grinding eddies and waves into small sizes and suppressing turbulence. The zonal flow is formed more significantly in the case in which instabilities are weak (bottom). 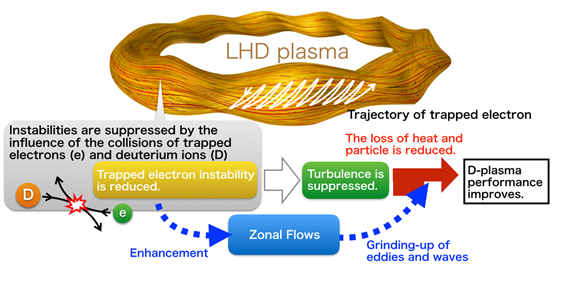 A schematic image of trapped electron instability and the mechanism for the suppression of turbulence in deuterium plasma. When ion mass is larger, instabilities are reduced and the zonal flow increases, and the loss of heat and particles in the plasma is suppressed. This is called the hydrogen isotope mass effect. This is a general term for physical influences upon stability and confinement brought about by ion mass. Turbulence behavior in high-temperature plasma confined in the magnetic field is described mathematically through a dynamical equation in five-dimensional space (the three coordinates of space to which two components of particle velocity are added). The flows of water and air as expressed in three-dimensional equations differ significantly from five-dimensional plasma behaviors in complexity and diversity. Utilizing a supercomputer, we solve the five-dimensional equations at high speed to analyze plasma turbulence phenomena. At NIFS, in joint research with Nagoya University we are advancing in developing the “GKV” simulation code. Flow structure that is spontaneously formed in turbulence. The direction of flow reverses at a certain distance. The term “zonal flow” comes from the striped pattern in which flows continuously reverse. The reversed direction of zonal flow grinds eddies carrying heat and particles, and confinement is improved. Zonal flow is also formed in the striped patterns in Jupiter’s atmosphere.